The SCHA will start to upload images and stories from the past. Just click on the newspaper clipping to enlarge it. look for the names like Jackie Harcourt and Pete Bishop (Jordans Dad), and Elaine as SCHA president. It could be said that the founding of the South Coast Hockey Association started from the vision and drive from an ardent player in Joan Hutchinson. Joan was the instigator in getting two high school teams together to play a game of hockey in 1973. The teams were a boy’s team from Yankalilla Area School and a girl’s team from Victor Harbor High. This resulted in the game being played between mixed teams (both schools teams were mixed, i.e. girls & boys). 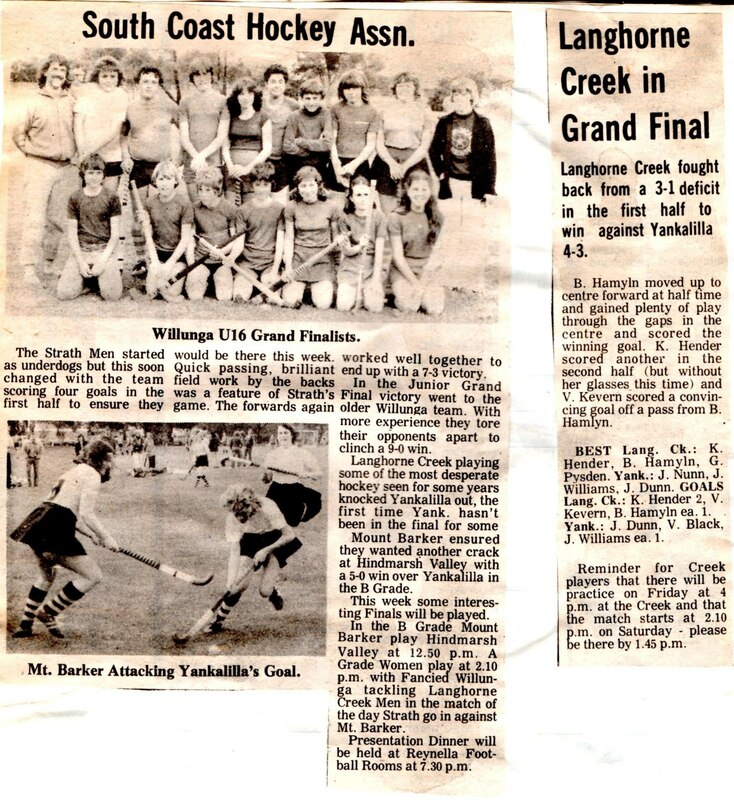 By 1975, there were 3 Men’s teams – Yankalilla, Victor Harbor High School and Encounter Bay; and 5 Women’s teams – Yankalilla, VHHS, Encounter Bay, Bible College and Strathalbyn. 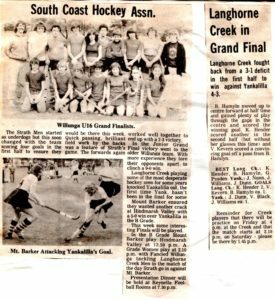 The following year another Women’s team joined being Langhorne Creek. 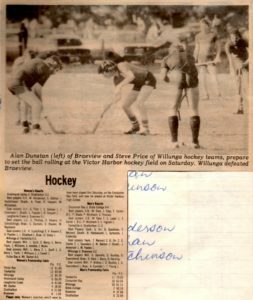 1977, teams from the Bible College and Willunga joined the Men’s competition and a Mt Barker team joined the Women’s competition. And so by 1978, the Association grew with 5 Men’s teams and 7 Women’s team and the introduction of a Junior competition with an Under 15 division between Yankalilla and Victor Harbor. 1979, Braeview joined the Association creating another Men’s and Women’s team. 1980, the Men’s competition now had 7 teams, the Women’s had an A and B division with 5 teams in each grade and the Under 15 became Under 16 with 5 teams competing. 1985, Under 16 became known as Juniors. It was around this time that the SCHA Committee decided not to split the Juniors into boys and girls, but to keep them integrated which was thought would help their individual growth. A practice that is still followed today. 1986, Cove joined the Association and an Under 19 competition was introduced alongside the Junior competition. 1990, both Men and Women had an A and B grade. Under 19 was dissolved. 1992, Men had 10 teams and Women 11 teams in A and B divisions, Juniors now divided into Under 15 and Under 13. 1993 Men become one division with 9 teams. 1994 Women became one division with 8 teams. 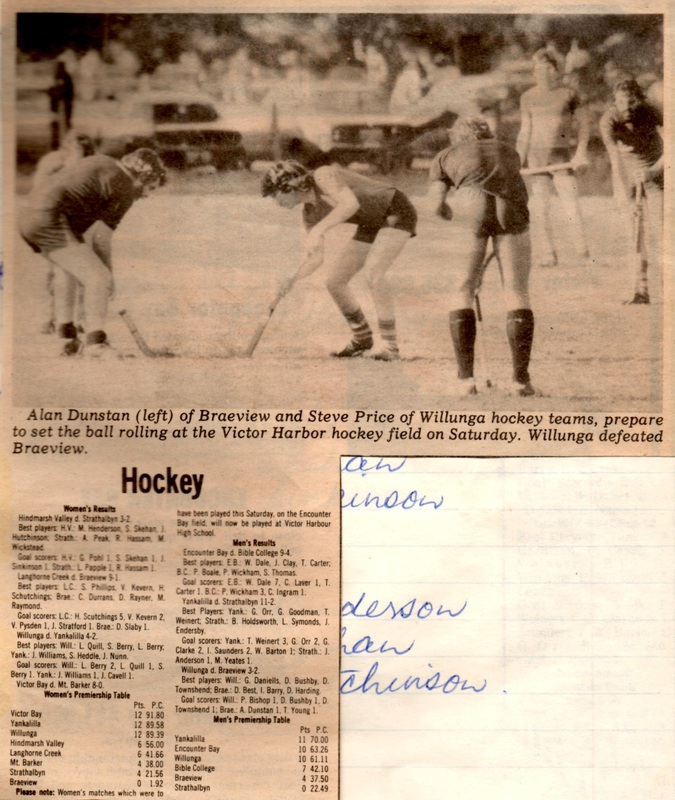 In 1995, the Willunga Hockey Club moved to its present location and changed their name to the Aldinga Bay Hockey Club Inc.
Are you able to help the SCHA by filling in the blanks or by telling us if something above needs changing. If so, please E-mail us.